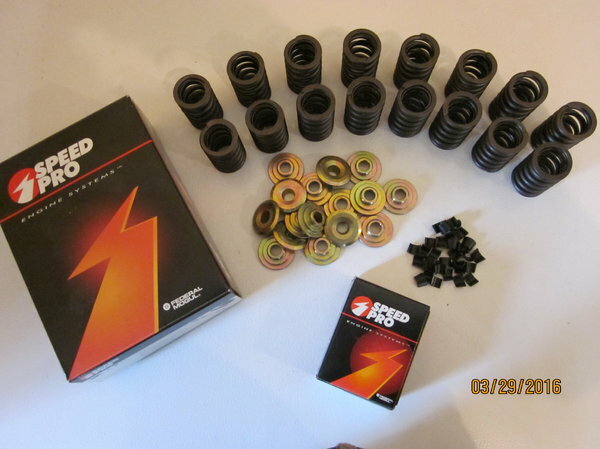 New set hi-perf dual coil plus damper valve springs, retainers, locks for BBC Big Block Chevy Chevrolet. Includes 16 pcs SpeedPro #VS1581 outer coils with dampers and 16 pcs SpeedPro #VS1605R inner coils. Seat pressure is 130 lbs at 1.880 installed height, 340 lbs at .600 inch max lift. Outer coils are 1.446 inch OD, inner coils are .718 inch ID. Coil bind occurs at 1.220 inch height. Includes 16 pcs SpeedPro #VSR-7002R gold anodized 7-degree chrome moly steel retainers, and 32 pcs SpeedPro #VK-338R machined 7-degree chrome moly steel locks for 3/8" dia valve stems. Perfect for roller cam or flat tappet cam (hi-zinc oil required), race or street. Summit price is $300, but I am no longer building engines, so my price for this nice spring package is only $150 with free shipping. Call Dave in Muskegon, MI 231-773-0971.